Emmentaler is Swiss Swiss cheese. 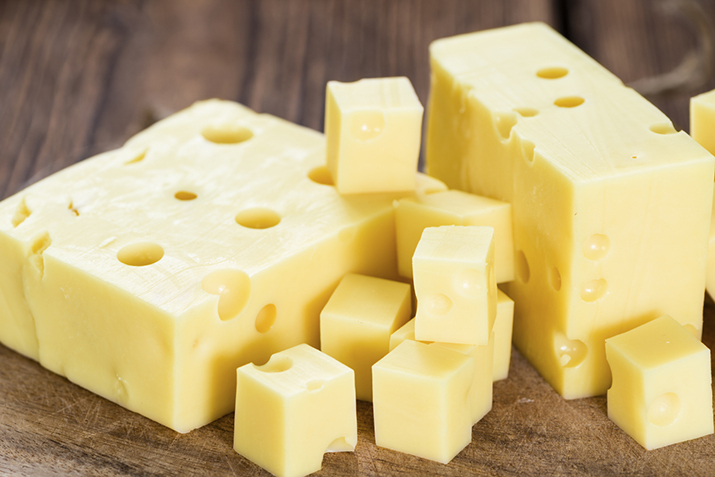 That is to say it's Swiss cheese that originated in Switzerland—in the Emme River Valley, to be exact. First made in the 13th century from unpasteurized milk from cows fed on grass and hay, it's also called Emmenthal and Emmenthaler. Medium-hard and uniformly yellow, Emmentaler has a slightly salty, nutty, buttery, slightly fruity taste that sharpens as it ripens. Firm and elastic, it's easy to slice and often has a thin rind covered by paper with the cheesemaker's name on it. Emmentaler is authentically made in large wheel shapes—about a yard in diameter and six inches thick, up to 220 pounds per wheel. Like other Swiss cheeses, Emmentaler has air pockets (holes or "eyes") formed by gases that are given off as the cheese cures from the inside. The process takes about six months. In general, the larger the eyes in a Swiss cheese, the more pronounced its flavor. Swiss immigrants brought Emmentaler cheese, along with the recipe and copper kettles, with them to America in the mid-1800s and started making the cheese in New York and Wisconsin. While some cheesemakers in the U.S. still honor the traditional methods of producing Emmentaler, others have made changes through the years, resulting in American Swiss cheese. Smaller wheels, allowing for quicker curing time, are now made, for example, and pasteurized milk is used. Classic Emmentaler is aged for at least four months. It has a golden yellow rind and a mild, nutty, delicate taste. Emmentaler AOP Réserve, or Réserve Emmentaler, is aged for eight months. Considered a gourmet cheese, it has an aromatic, spicy, strong flavor and a dark yellow rind. Emmentaler AOP Extra is ripened for at least 12 months and has a dark brown rind. It has a strong spicy taste and a crumbly texture. Emmenthaler AOP Cavern is aged—at least some of the time in a cave—for about 14 months. It's very aromatic, with a dark brown to black rind. A great melting cheese, Emmenthaler is perfect for cooking. Try it in place of one of the cheeses in Three Cheese Fondue, for example, and in French onion soup. Substitute it for American Swiss in any recipe, like this Savory Stuffed Pumpkin or this classic Reuben Sandwich with Russian Dressing. Shred it into casseroles and gratins, and slide it atop burgers. It's delicious unmelted, too, of course. Tuck it into a turkey and/or ham and cheese on rye or grate it atop any green or grain salad. Emmentaler is also the perfect appetizer or dessert cheese. Use it on bruschetta and pair it with fruits like apples and pears and nuts. Serve with pale ale, a stout or lager, or a riesling, merlot or pinot noir. Store Emmentaler in cheese, waxed or parchment paper in the refrigerator. If you have a large wheel of cheese, you might want to wrap it in cheesecloth, followed by paper and then plastic wrap.